Thyroid function tests are not always straightforward, at the pathology lab where Dr Sikaris works, thyroid function tests receive the most queries of any test performed. It was great to have Ken back with us to describe the fundamentals of thyroid disease and using case examples from blood tests, explain the intricacies of interpreting thyroid function. 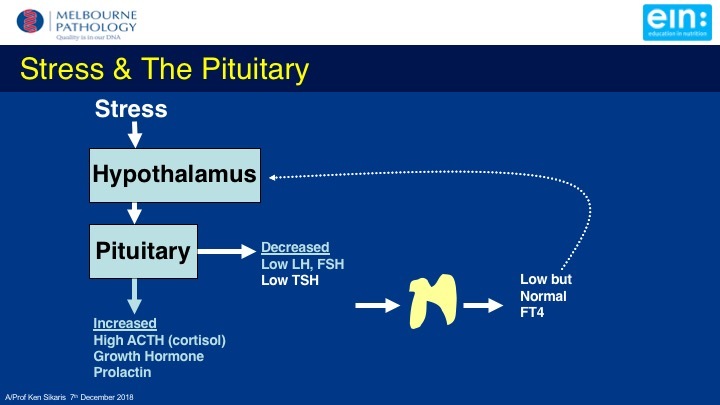 He covered: variations in normal thyroid function tests including pregnancy, urinary iodine measurements, hypothyroidism, Hashimoto’s disease, Fetomaternal Microchimerism, Hyperthyroidism, Grave’s disease, the effect of stress and amiodarone on thyroid function. The slide above shows the changes which occurred to a 52yr old man who had been diagnosed with hypothyroidism (01/05/2015). 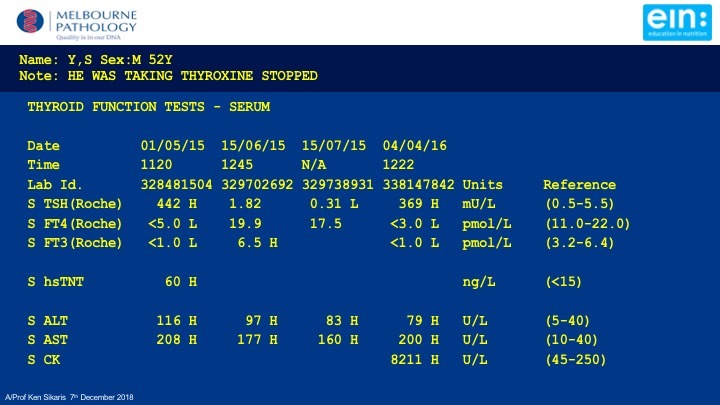 His thyroid function improved when he took thyroxine (15/06/2015). A few months later he stopped taking thyroxine and resulted in hypothyroidism again (04/04/2016). Ken trained as a scientist, then medical practitioner, at Melbourne University before settling as a chemical pathologist who now has three decades of experience in public and private laboratories. He has worked at Melbourne Pathology for 15 years, where around 3,000 patients have their thyroid function tested each day.